Are you looking for the health benefits of archery? It may not seem like you will get much out of it, but there are many different benefits you can get by taking up this sport. 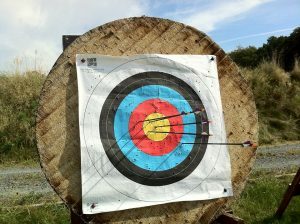 Depending on the type of bow you get, it can take a significant amount of strength to draw the bow and take your shot. And that doesn’t even take into account the amount of concentration required to line up a shot and not miss. This will not only give you physical benefits with your strength, but mental ones as you develop your skill. Keep on reading to find out exactly the improvements that you can see with practice. Strength – In order to draw the higher weight bows, you actually need quite a bit of strength. Even some of the lower powered ones require strength to draw too. If you are using a compound bow, recruve bow, or longbow… then there is also the time where you are holding the draw back which forces the muscles to tense like normal weight training, and this leads to muscle development. Drawing a bow will help develop your chest, hands, arms, and upper back muscles. Coordination – In order to pull off the perfect shot, may things need to be perfect. This can be everything from your feet placement, the angle that you stand, the direction your bow is pointing, your grip of the bow, and hand-eye coordination. All of these things come into play when lining up a shot – particularly longer ones. Fitness – Typically when you are practicing shooting you are doing it for an extended period of time. As we discussed in strength, you are working your muscles when setting up your shot. Studies have been done showing that you are also burning around 140 calories an hour when shooting. On top of this you will be doing a fair amount of walking when retrieving your arrows, so you can be sure you will get some exercise in when you are firing your arrows. Focus – Archery isn’t as dynamic a sport as some others. It requires putting yourself into a pre-determined position and maintaining complete focus while you create your shot. As you get better with archery your ability to completely focus should greatly increase as you get better shooting. You can apply this new found focus to other situations in life that require your concentration. Social – Archery is a very social sport. When you go to the range you will find many other archers, all of various skill levels. Not only can you make many friends, you will be able to talk with and learn from others who have more experience than you. If you start getting into competitions then you can also begin taking part of team events with others to further your progress. Competition – As much as archery is an individual sport that allows you to be highly competitive with yourself, there are also many options to compete against others. Taking part of and doing well in this competitions is a great benefit for many people and can help boost your confidence as you see yourself doing better and better the more you practice. These are just a few of the health benefits of archery you can find when you get started. There are many more but we will leave you to discover those as your practice develops. Hopefully you take this as motivation to give the awesome sport of archery a try!